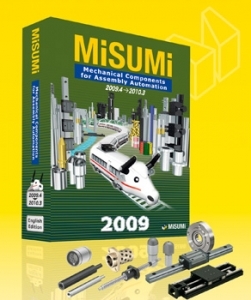 A new edition of Misumi's main catalogue of mechanical components for factory automation will be available in mid-March. The number of pages has been increased from 2700 to nearly 3000, with about 65,000 products covered, including, for example, the compact, ready-to-install LX series of linear motion units for tasks requiring high precision and economy. The series is suitable for the use in a variety of industrial areas thanks to the diversity of models available. In contrast to traditional products, Misumi's clutches do not convert moment torque by means of mechanical connections, which are susceptible to wear, but rather they use magnetic attraction. Standardised versions of AT-profiles are now also available, as well as several versions of components that were featured in the 2008 catalogue as custom parts, but which are now offered as standard parts. The 2009 catalogue will initially be available in printed form in German and English. Starting from the second quarter of 2009, the catalogue will also be available from the Misumi website as a PDF file in Italian, French and Czech.